The Mistle Thrush (Turdus viscivorus) is a common member of the thrush family Turdidae. It is found in open woods and cultivated land over all of Europe and much of Asia. Many northern birds move south during the winter. 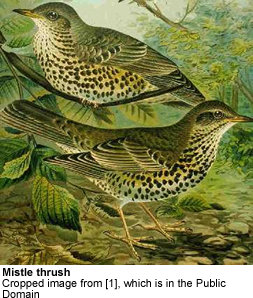 The Mistle Thrush averages about 27 cm long, larger than the similar Song Thrush. Males and females look alike, with plain greyish brown backs and neatly round-spotted underparts. The breast has much less buff than the Song Thrush. It is omnivorous, eating a wide range of insects, earthworms, and berries. A Mistle Thrush will defend a berry-bearing tree against other thrushes in winter. Migrating birds sometimes form small flocks. The male sings its loud melodious song from a tree, rooftop or other elevated perch, often during bad weather or at night, and starting relatively early in the spring — hence the Mistle Thrush's old name of "Stormcock". The song is like a harder and simpler version of the Blackbird's. The alarm call is said to sound like a football rattle (a form of musical ratchet) or machine gun.